High in an apartment block a lonely girl sits gazing at the stars. On the streets below traffic buzzes by and a stray dog wanders past. The opening scene of Spare Parts Puppet Theatre’s latest children’s show is constructed from bits of wood, foam and fabric, and the cars are being pushed along by two actors. But the emotions are genuine and so is the response from the audience (mostly children under eight) who interject and laugh uproariously throughout the 60 minute show. The Night Zoo is written and directed by Michael Barlow and follows the journey of Jamie, who isn’t allowed a pet in her apartment and instead dreams about making friends with zoo animals. It’s a more light-hearted production than last season’s The Farmer’s Daughter, chock-full of colourful puppets and snappy banter, perfectly pitched for kids. Jamie’s visit to the zoo provides opportunity for plenty of creativity. 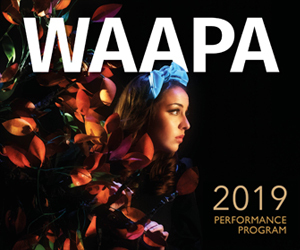 Puppet-maker Iona McAuley’s work has stood the test of time (the show premiered back in 2009 and this is its fifth revival) and her collection of animals are wonderfully characterised by Lee Buddle’s pre-recorded Dixieland jazz score. A slinky, muted trumpet solo accompanies the thorny devils, a honking baritone saxophone heralds the waddling penguin and the shaggy orangutan struts around to four-bar blues. 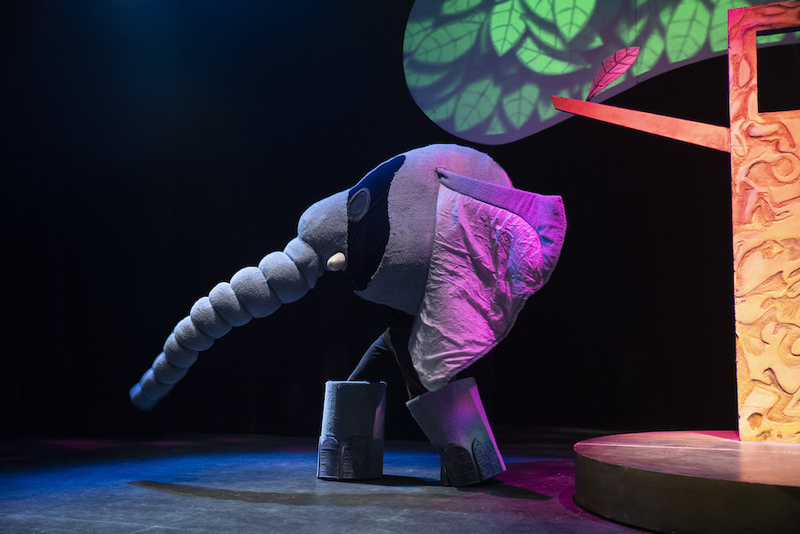 The entire show – animals, narrators, Jamie’s character, set changes – was performed by the remarkably versatile Kylie Bywaters and Isaac Diamond, whose playful antics kept the audience enthralled. Bywaters and Diamond transitioned smoothly from commentators to puppeteers and their dexterity made the animals seem so much more than just a mask or a toy on a pole. The elephant required the puppeteer to wear a huge head and ears, operate the trunk with a pulley and stomp around in two enormous boots. The elephant poo was the finishing touch, two hessian lumps deposited inelegantly as the elephant exited the stage. The children in the audience couldn’t be more delighted as the two narrators poked and tossed the lumps with great histrionics. My children declared the dog to be their favourite. His mournful eyes and joyfully quivering tail stole their heart and Jamie’s when he bounded across the stage on the end of two sticks. We were all delighted when Jamie was allowed to take him home. It was a predictable ending but the beauty of this show is its touching simplicity and playful ingenuity. It’s a magic formula that could well inspire a holiday of dress-ups and box-collage splendour. The Night Zoo is 10am and 1pm daily until 6th October. Recommended for ages 5+ but 3+ would also enjoy this show. Read a review of this show by one of Seesaw’s junior critics, Isabel (age 8), here. Pictured top: Isaac Diamond and Kylie Bywaters transition smoothly from commentators to puppeteers.